Too right it is! 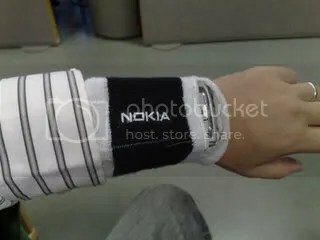 The more frightening thing is that it’s actually official Nokia goods. Yes, that’s right. Nokia really made this and intended real people to use it. 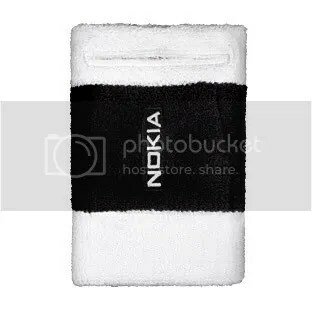 Nokia Wrist Band CP-218 – Keep trim and in touchA handsfree workout is no sweat with this soft cotton wrist band. 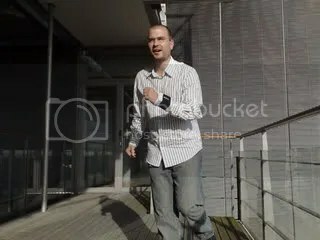 The CP-218 holds and protects most Nokia devices as you stay in shape. Listen to music, stay in touch, and when you’re done put it through the wash with the rest of your kit. Maybe it’s best to take your N95 or whatever device out before putting it in the wash? Hmm, some applications in sport may make this feasible. Use it anywhere else and you’re begging for strange looks. « Phone start up times. How quick is yours?